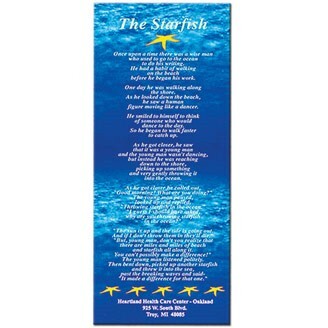 Make a mark on your customers with a custom logo or message bookmark. Great give-away to promote a school, library, book club, conference, save the date, a new book, author or website. Full color imprint on one side, 16 pt. film laminated paper board. Optional tassel available. Borders are not available. Size : 3" x 7"
Imprint Area : 3" x 7"